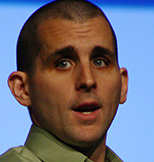 Scott Berkun is the bestselling author of The Myths of Innovation, and Making Things Happen. His work as a writer and public speaker have appeared in The Washington Post, The New York Times, Wired Magazine, Fast Company, Forbes Magazine, The Wall Street Journal and other media. He has taught creative thinking at the University of Washington and has been a regular commentator on CNBC, MSNBC and National Public Radio. His many popular essays and entertaining lectures can be found for free on his blog at www.scottberkun.com.